In this post we are going to discuss about Apache Cordova and Ionic. You might be hearing the term Apache Cordova and Ionic Framework a lot in recent times. So What is Apache Cordova and What is Ionic Framework. How Apache Cordova is connected to Ionic Framework or What is the relationship between Apache Cordova and Ionic Framework. We will be answering these above questions in our blog post. What is Apache Cordova ? 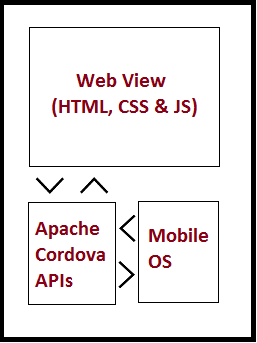 For better understanding of Apache Cordova, lets have a look at the following image. Thus now you are familiar with how Mobile Hybrid Apps are structured and how you can use the device features from the Web View. Ionic is focused mainly on the look and feel, and UI interaction of your app. Ionic is here to simplify one big part of your app : the front end. Ionic currently requires AngularJS in order to work at its full potential. How Apache Cordova is connected to Ionic Framework ? Ionic build on top of Cordova. Apache Cordova takes care of packaging your HTML5 app as a native app that can run in Android, iOS and Windows. So w can say that Ionic Framework is nothing but a Web View in our previous example. Where Ionic Framework talks with Apache Cordova to get information about Mobile Operation System. Apache Cordova is the bridge between Ionic Framework and Mobile OS. Very good and effective page for beginners in ionic framework. Helped me to understand Ionic concepts in a more simple way.